We received a phone call last week from the Vero Beach Humane Society saying they had found one of our dogs, Ollie (yet another WONDERFUL reason for micro chips!). 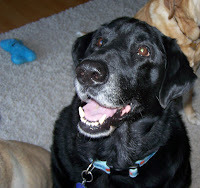 Ollie is a wonderful, calm, older, black labrador. We contacted the owner and heard nothing back. After seven excruciating days we got him back – today! He was found swimming a canal. How he survived we don’t know but he is still his Jolly ole self. He has some severe ear/bacterial infections but we will get that sorted out. For everything Ollie has been through, he still smiles and wags his tail. We will give you an update on how he is doing. Today was his first day back. UPDATE: Ollie’s ear infections are getting better. I am still in awe at how wonderful he is. I just want to wrap him up in a blanket and keep him safe for ever and ever. Finally heard from the prior owners and he somehow got out and ran away over a month ago. They never told us this happened. We thought he saw safe and happy. Note to adopters: please contact your rescue when your animal goes missing. The good rescues will go the ends of the earth to make sure the animals they have placed will be found.